Caissa is an academic journal for the history of chess and other board games from the earliest beginnings to the present. There will be two issues per annum with approximately 90 pages. Articles will be published in English or German with a summary in the other language. 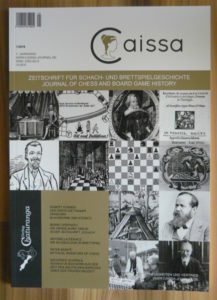 For an subscription of Caissa (special discount price of 12,90 € per issue, can be terminated after minimum acceptance of two issues, with a deadline of two months to the end of the year) please contact us via eMail, info(at)caissa-journal.de or our via our contact form.